Keep it Simple Sister (K.I.S.S.) – Radon can be a little complicated. As a Realtor don’t burden yourself with providing detailed scientific advice to your clients. Learn the basics about radon for yourself and for your clients. Then let the experts handle the rest. 1. Tell clients that radon is a soil gas that enters the home from beneath and can cause lung cancer. It is common in Colorado. 3. Point them to the Radon and Real Estate Transactions in Colorado brochure, which will answer most their questions and will take the monkey off your back! Link below. 4. Note – typically condos that are 3rd story or higher above the street do not need to be tested. Radon is a radioactive gas that enters homes through the soil beneath. Long term exposure to radon in homes can cause lung cancer. Radon is the 2nd leading cause of lung cancer in the U.S. Like oxygen, radon is colorless and odorless. 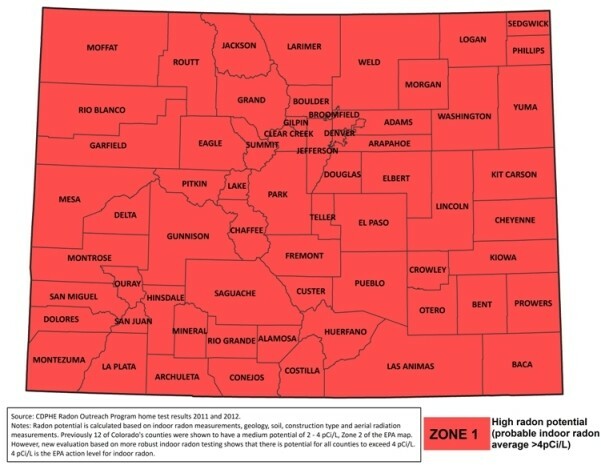 Radon is real in Colorado – Every Colorado county is in EPA zone level one, which means every home has a high likelihood of high radon. About 1/2 of the homes in the Denver area are thought to have elevated radon levels. But don’t be afraid – Radon is common and any house can be fixed. Most houses can be fixed for about $1,000. It’s never a reason to not buy a house. Repeat, the presence of radon in a home is NOT a reason for forego a home purchase. Learn the terminology – Radon is measured in “picocuries per liter of air.” Practice saying that a couple times so it quickly rolls off your tongue. The abbreviation is pCi/l. Sometimes we just say “picocuries,” which is fine. Is there a safe level of radon? – The current recommendation is to fix houses that measure 4 picocuries per liter of air and above. 4 picocuries is known as the “Action Level.” Keep things simple for your clients: if the reading is at or above 4 picocuries per liter of air – advise to fix the house. How long does it take to test a house? – The minimum test duration is 48 hours. The doors and windows in the house should be closed for the duration of the test period. Measurement cost? A professional test should be less than $200. Can my client use a DIY kit from Home Depot? – Technically yes, practically no. Hardware store test kits work great but their laboratory turnaround time is usually longer than the inspection contingency period. Also the test result won’t have professional credibility so it could be challenged by the home seller. Professional testing companies use electronic equipment that provides credible, immediate results. What if the house has a mitigation system already? – Measure the house again unless it’s been measured in the last year or two. We’ve seen many radon systems that visually appeared to be OK but weren’t effectively mitigating the radon. We can’t rely on our eyes when it comes to the health of the radon system and consequently the health of the home. Who not to trust – There is LOTS of stuff on the internet about radon, often inaccurate, and frequently contradictory. Well meaning friends and family tend to be very opinionated about radon, and quick offer their “expert” advice. I’ll never forget one time when I measured a neighbor’s house that returned a quite high reading. Obviously I recommended she get the house fixed. She told me she wasn’t going to follow my advice because another neighbor “whose husband is an engineer and knows about these things” told her that it wasn’t a concern. Seriously? Your home buying clients are depending on you, so point them to expert advisors. ● Your tiny bible for radon – 90% of your radon information can be obtained by reading the brochure Radon and Real Estate Transactions in Colorado . Call2Inspect provides a paper copy of this guide with every home inspection. Only houses with basements need to be tested. False. Crawlspace and slab foundations tend to have lower radon levels, but they often exceed the EPA action level and should be tested. Houses with “structural” basement floors do not need to be tested. False. These homes tend to have lower radon levels, but they often exceed the EPA action level and should be tested. We’re not going to live in the basement, therefore radon is not a concern. False. Radon is highest in the basement but it circulates throughout the home. The test result was 3.9 picocuries, it’s lower than 4 so I don’t need to fix the house. False. 3.9 picocuries is not zero. It’s still very close to the action level of 4. You should consider fixing the house or measuring it again with the long-term protocol. The house was closed up for a long time before the test, the test result is going to be skewed high and not valid. False. Radon levels in the home reach a steady level after only a couple days so a house that has only recently been closed up will test close to the same if it was shuttered for months. My neighbor’s house has high radon, mine will too. Not necessarily. Every house foundation is unique. Measure the house before paying for a mitigation system. The radon action level in Canada or Europe is much higher than in the United States. We’re being overly cautious about radon here in the U.S.
False. We live in the U.S. so everyone here has to follow the same guidance and rules. The action level of 4 picocuries has been established for decades and is commonly known and accepted. In fact, the World Health Organization recently recommended that all countries adopt an even more conservative action level of 2.7 picocuries.